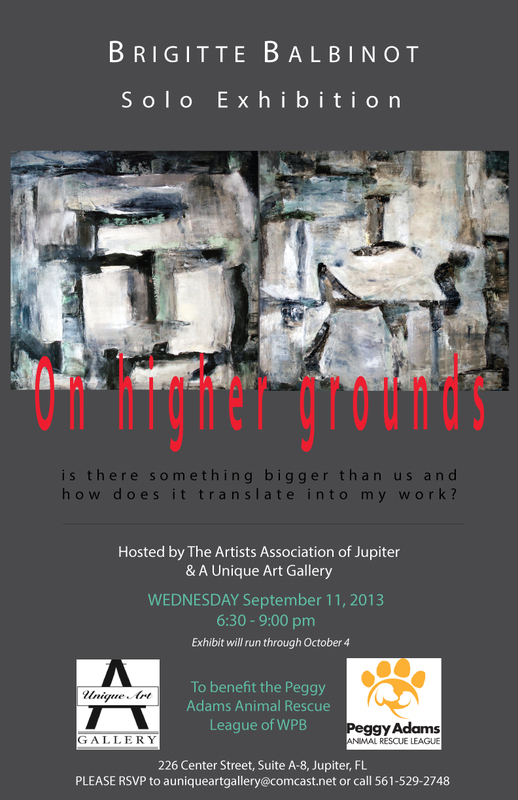 The Artists Association of Jupiter and A Unique Art Gallery are proud to announce “On Higher Grounds” Solo Exhibition by Artist Brigitte Balbinot, September 11, 2013 in Jupiter, FL. Come and meet great people and mingle with the Artist herself as she reveals her latest body of work! Portion of the proceeds will be donated to the Peggy Adams Animal Rescue League of West Palm Beach. ← First Solo Exhibit in Montreal, QC! !